From the moment I stepped into the Clubhouse I felt welcome; it was hard not to be suitably impressed. The hostess took me on a tour of the lounge (from the spa to the cinema room! ), revealing an understated décor but with that signature touch of style you’d expect from Virgin Atlantic. Despite there being quite a few people in the Clubhouse it never felt crowded or too busy. I easily found somewhere to sit and was offered a drink straight away. This laid-back feel made it easy to feel blissfully relaxed – so much so that my planned 30-minute stay turned into an hour-long visit. There are plenty of lounge chairs to relax in, or desks and tables to work at if you’ve got some emails to catch up on. There's also a pool table to help pass the time and an outdoor space if you want to do some plane spotting. You might even get to do some celeb spotting too; I saw Kunal Nayyar (“Raj”) from Big Bang Theory! Wi-Fi is free, fast and easy to connect to. And you’ll be happy to know that flights announcements are made over the tanoy, so you won’t miss your gate. And as for the spa I mentioned earlier: all guests receive a free treatment, so make sure you leave enough time for a massage or manicure. A friend I was travelling with had her nails done and agreed that it’s a brilliant way to start your holiday. Unlike a lot of lounges I’ve been in, there is full waiter service no matter where you’re sitting in the Clubhouse. There are breakfast, lunch and dinner menus available throughout the day so you can always find something tasty to eat. And there’s also the option of the deli if you’d rather just graze. One of the highlights for me was my Bloody Mary. Just the right amount of spice. But if that isn’t to your taste they have just about anything else you can think of; I also had a coffee while I was there. Being Australian I’m usually a bit of a coffee snob, but this was excellent. 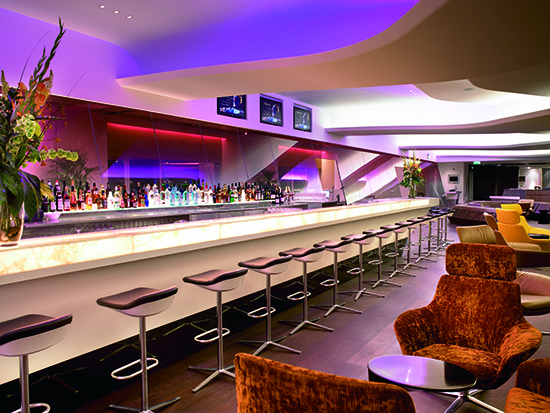 Make an appointment with one of our Travel Experts to arrange your Virgin Atlantic flights and Clubhouse access.